Today I am super excited to share with you one of my "secret projects"!!! It's called Pave the Way and I absolutely love, love love it!!! Pave the Way is featured in the Quilts from Quiltmaker's 100 Blocks Fall 2015 edition. 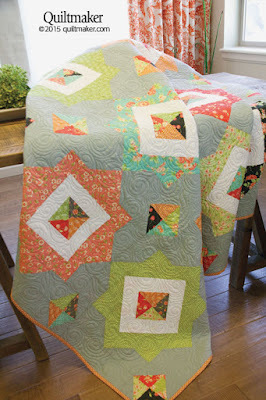 it uses Half Square Triangles and No-Waste Flying Geese so it is easy-to-piece and oh so much fun to make!! The design came from my original Pavers Stone Block that was in 100 Blocks Volume 11. I added a second block to offset the layout. I love that when you look at them at first it almost looks the same, but then, you start to see the rotation of the 2 blocks. Such fun movement!! I finished quilt quilt off with an all over swirl design. The fabrics are Farmhouse by Fig Tree Quilts for Moda and can I just say how much I love this line, especially the little pops of black!!! So fabulous!!! And that is Pave the Way!!! I hope you love it as much as I do!! It really is just so much fun to put together and such a lovely quilt finish :) And yippee, it is so fun to finally get to share!!! Thanks for popping in today and always!!! You guys are the best!!! I love it! I really need to get this issue! Very pretty Melissa. I really like the other version with the holiday fabrics shown in the magazine too. NOT that I really want to think about how close the holidays are for those who have a million sewing/quilting projects they'd like to get done ......errrrrr start for gifts. Beautiful! I love that line of Fig Tree fabric as well, the black just calls my name! 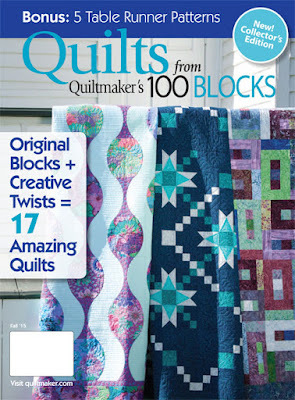 I liked your block so much, I bought the magazine last night. 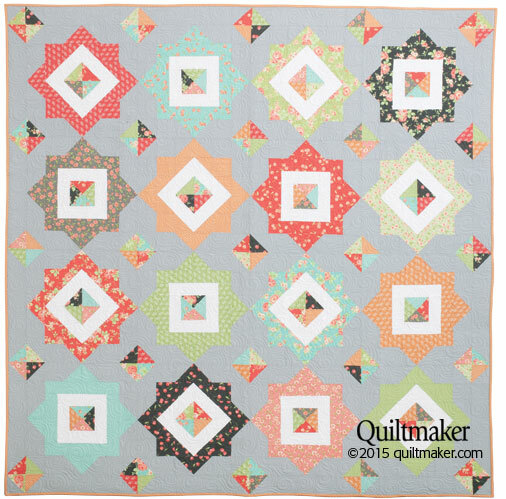 I really like this quilt and the colors you used. What a fun quilt design and I love that you used the new Fig Tree line. I have been thinking about getting a stack of fat quarters and now I am sure that I should. I will be looking for the magazine right away.